Get Rs.50 Freeecharge Coupon absolutely free with every Rs.140 Scotch Brite Sponge Wipe Pack . Check out below post to find more. One user can use maximum of 2 voucher codes. • By using the Coupon provided in the 3M Sponge Wipe pack or redeeming the Offer provided on the same, a participant agrees to be bound by the terms and conditions below (“Conditions”). • On purchase of Scotch Brite Sponge Wipe Pack worth Rs. 140, user will get a 12 digit code which can be redeemed for Rs. 50 in the user’s Freecharge account. • These Conditions are applicable for the Offer which will be valid from 1st Oct, 2016 to 30th Nov, 2016 (hereinafter referred to as “Offer Period”). • These Conditions apply to every person (“Participant”) redeeming the offer given by 3M. • No claim shall lie for any redemption requests made after the expiry of the Offer Period. 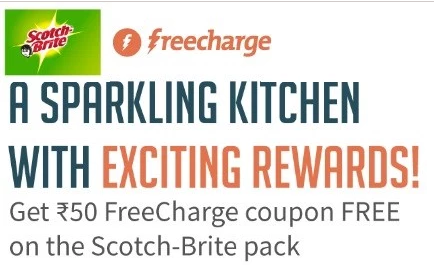 • Offer is Valid for transactions made at www.freecharge.com or on the Freecharge App. • Offer valid on Scotch-Brite Sponge wipe 3s pack Rs 140 and Scotch-Brite Handle Mops. • All Participants agrees that FreeCharge offering discount coupons may at any time stipulate additional terms and conditions for redemption of discount coupons and such terms and conditions shall be binding on the Participants and shall apply to every redemption of recharge/discount coupons by the Participants. • Freecharge holds the right to refuse transactions deemed fraudulent as per Freecharge policies. • We reserve the right to modify/change, discontinue, terminate, withdrawn the Offer at any time during the Offer Period at its sole discretion without prior notice or assigning any reason. • The Participant acknowledges that relevant state and central taxes may be deducted by the merchant while redeeming the discount offer and therefore, the amount reflected in the coupon may not be the same as the final redemption value received by the Participant. • In no event shall 3M be held liable for any issues relating to the redemption of the coupon including redemption request not being honoured by FreeCharge. In no event shall the maximum liability exceed the value of the coupon. • Any disputes or differences in connection with the offer shall be governed by laws of India and shall be subject to the exclusive jurisdiction of the Courts at Bengaluru. 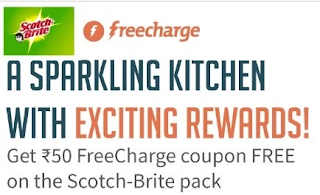 How to Get Free Rs.50 Freeecharge Coupon with Rs.140 Scotch Brite Sponge Wipe Pack ?